The name of HiFiMan’s latest flagship headphones, the SUSVARA, has its origins in India and means sweet-voiced in a feminine way. The SUSVARA is a representation of the company’s progress in planar magnetic technology. This is something that HiFiMan has worked on for almost a decade now since the founding of the company by Dr. Fang Bian in 2007. It is fitting perhaps, that the SUSVARA is a special commemorative product, built to commemorate HiFiMan’s first decade in the Head-Fi business. 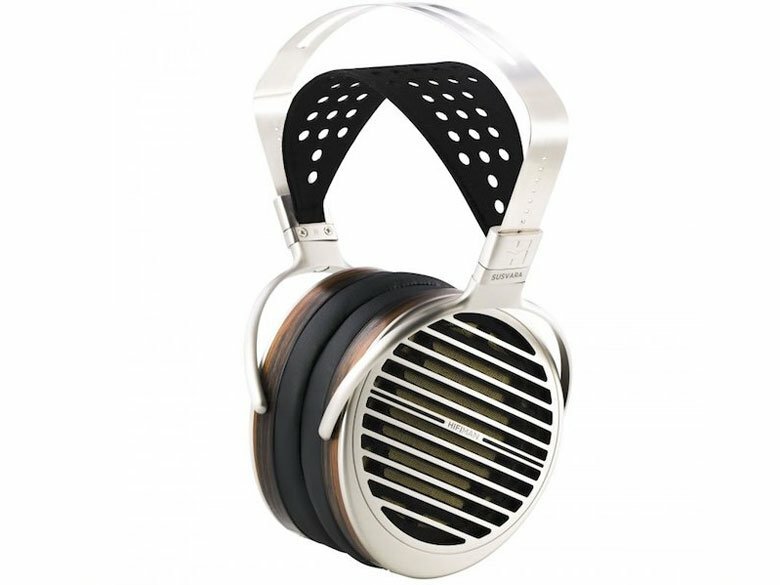 Priced at USD 6,000 (SGD 9,600), the SUSVARA is the company’s second attempt to raise the price benchmark for TOTL headphones. The first was when they raised the bar to USD 2,999 in 2014 with the introduction of the HE1000. Prior to the announcement of the SUSVARA, the TOTL price benchmark seems to have stabilised at USD 4,000 with LCD-4 and Utopia from competitors Audeze and Focal priced at USD 3,995 and USD 3,999 respectively. The question to ask is whether the SUSVARA would justify the leap from the TOTL price benchmark of USD 4,000 to USD 6,000 since this premium of 50% is hardly one that would go unnoticed. The SUSVARA arrived in a leather-wrapped box which included a felt bag, a hard-cover owner’s guide, and two 3-metre long cables; one terminated with 6.3mm Neutrik plug with the other terminated with a XLR 4-pin Yongsheng plug. The cables are configured using a special composition ratio and quantity of single copper and silver crystalline wires, which HiFiMan says will translate to low signal transmission resistance and high mechanical strength. Weighing in at 450g (15.9oz), the SUSVARA is slightly heavier than the HE1000 V2 (420g). The headband on SUSVARA combines a special metal alloy with fine calf’s skin to form a sturdy arch structure, the perforation on the calf’s skin helping to dissipate heat when wearing. While it features the same improved headband design first implemented on the HE1000 V2 which accommodates for a wider range of head sizes, the SUSVARA implementation, however, included the addition of PTFE strips at the joint of the rotating mechanism. This is a minor but significant upgrade as it prevents the “chill-sending screech” when the metal alloys of the mechanism come into contact with each other. 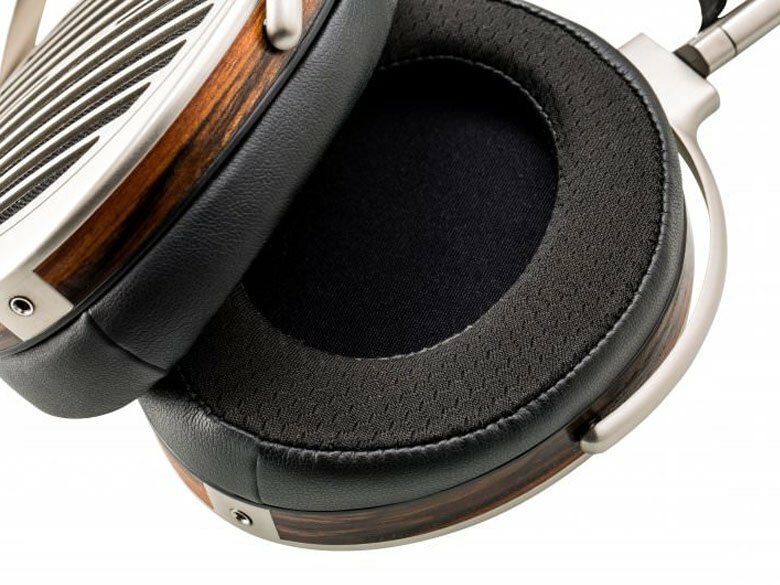 HiFiMan continued the use of polyester on the surface of its ear pads that are in direct contact with the head for the purpose of increasing sonic transparency with the surrounding area finished in pleather. The clamping force is light making the SUSVARA one of the most comfortable headphones I’ve experienced. What differentiates the SUSVARA from other planar-magnetic driver offerings is its drivers. 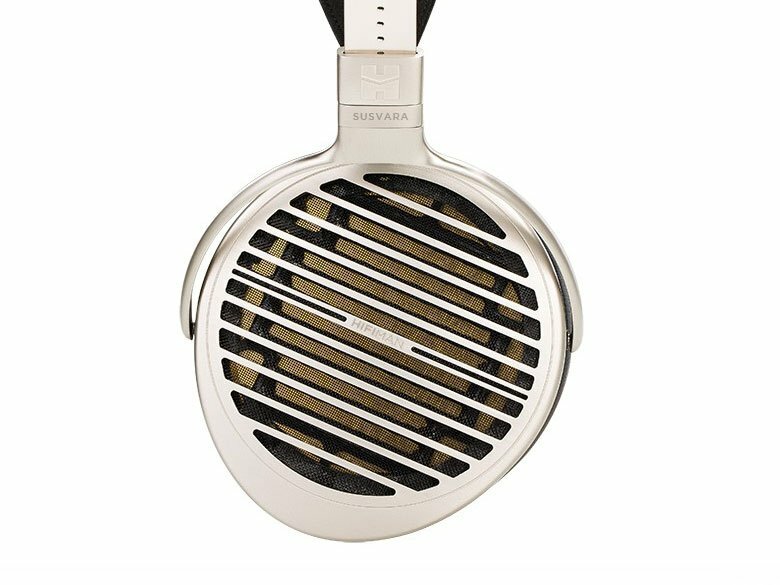 SUSVARA’s planar-magnetic drivers showcase the advancement of HiFiMan’s capabilities in its “nanometer-grade” diaphragm technology, magnet and grill design. The SUSVARA features an Ultra-Thin Driver made only possible by the company’s advancement in Nanotechnology. At less than 0.001 mm, its nanotech diaphragm is so thin, it is not visible from the side with the naked eye. In theory, this translates to better high-frequency response and more sonic detail. To match the microscopically thin diaphragm, HiFiMan used voice-coil traces made of pure (24k) gold. 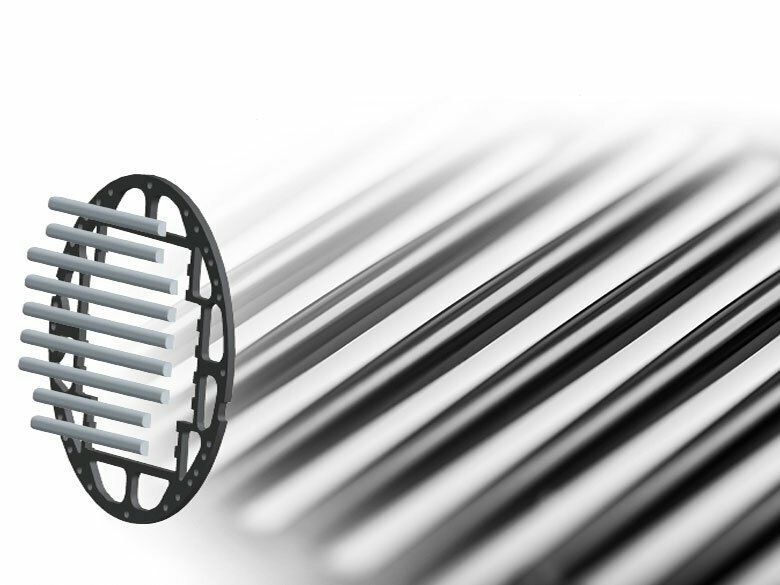 The flexibility of pure gold allows the company to create voice-coil traces that are extremely thin and light to complement SUSVARA’s nanometre-grade diaphragm. The use of extremely thin voice-coil traces contributed to the resistance of the headphones, which greatly reduces the sensitivity of the SUSVARA. The low sensitivity meant that the SUSVARA must be driven by a robust headphone amplifier, requiring a minimum voltage output of 22Vrms and minimum power output of 8.354W at 110 dB SPL. This is based on the product specifications of impedance at 60 ohms and sensitivity at a low of 86 dB, making the SUSVARA one of the most inefficient headphones in the market. Failing to pair the SUSVARA with a matching headphone amplifier will result in preventing the SUSVARA from fulfilling its potential. Having experienced the SUSVARA when pairing it with Cavalli Audio’s Liquid Gold and HeadAmp’s GS-X mk2, both reference headphone amplifiers in their own rights. The SUSVARA was poor in the mid-range with muddy imaging and sound separation. Traditionally, magnets tend to obstruct sound waves and creates interference through primary diffraction in the form of wave distortion as frequency changes during sound wave reproduction. Inspired by the F-117 Stealth Fighter, the stealth magnets is an innovation from the company’s R&D team. The rounded magnets are profiled and optimised, allowing them to be transparent and permissive for sound waves while moving the diaphragm. The SUSVARA features HiFiMan’s signature “Window Shade” grill design which is precisely structured to avoid the occurrence of a secondary diffraction in order to eliminate unwanted distortion and vibration. The design is optimised for opened-back headphones with the objective of creating an audio experience represented by a wider soundstage, harmonic imaging, and pure clarity while providing protection to the nanotech diaphragm with appealing visual aesthetics. With the SUSVARA, HiFiMan raised the price benchmark for the TOTL headphones, with a 50% premium over the previous benchmark, and hence one cannot help but have high expectations of the SUSVARA. For the purpose of this review, I have selected the High-Resolution Audio album of the self-titled album (24-bit/96kHz FLAC) by American musician St. Vincent. The album is one blessed with a wealth of fantastic music, thoughts and rhythms, St. Vincent has a distinct musical style, one which blends soft rock, experimental rock, electropop, and jazz influences and is not afraid of taking risks with the mixing and technical aspects in every single track. The album features an impressive amount of gutsy hyper-directional stereo mixing, with instruments and even vocals regularly panned in all directions keeping the ears and brains continually engaged by the manner which different notes fly around in the mix. A great album to test how well the SUSVARA can image, and present different frequency ranges. Track No. 1 “Rattlesnake” starts with a synth bass melody which allows the SUSVARA effectively portrays the electronically generated tones in a manner where one can not only hear but feel the tense repetitions that are exasperatingly catchy throughout the song. The SUSVARA really shines when the song breaks into a drum-like guitar solo where one can hear the layering and separation, allowing both the synth bass and guitar to co-exist in perfect harmony with neither’s presence being overwhelming. Track No. 3 “Prince Johnny” showcases punctuating rhythmic drums from the start to the end, reverberating beneath a church choir of airy vocals. The bass reproduction of the drums is simply awe-inspiring, the lifelike tonality keeps the pulse going, solidifying the foundation and provides the feel of the drumbeat that gives the song its groove. Track No. 11 “Severed Crossed Fingers” exhibits the depth and dynamic capabilities of the SUSVARA. With a stunning resolution and a mid-range that is a perfect balance between the highs and lows, outlining Annie Clark’s vocal in euphoric fashion bring out the directness in what might well be the most personal song she has ever composed. Track No.7 “Regret” is one of my favourite test tracks to evaluate the treble capabilities of headphones, embedded in an array of musical arrangements comprising mainly a mixture of bass and mid-range instruments is a harp, which exhibits extremely smooth transitions from the upper-mids to treble with impressive realism, faithfully representing what is in the recording. The SUSVARA is perhaps the most revealing and neutral sounding headphones I have experienced, with a soundstage that is coherent yet open and spacious. The dynamics of the SUSVARA and its ability to respond to small signal changes depicting spontaneous fine gradation of sound differentiates itself from the competition. Its outstanding imaging and separation capabilities makes listening to well-mastered albums like St. Vincent a joy on the SUSVARA. Having spent 3 weeks with the SUSVARA, it has impressed me and left me wishing that my Focal Utopia has its soundstage. Given its merits throughout the experience, the SUSVARA is a fitting product to challenge the TOTL price benchmark. However, there are areas for improvements to the accessories that came with the box as well as the overall finishing and workmanship of the headphones to make the asking price more palatable. Finally, do note that only a handful of headphone amplifiers are robust enough to power the SUSVARA and that might add to the cost of your purchase. This review unit is provided by AV One (S) Pte Ltd and is part of HiFiMan’s SUSVARA Tour in Singapore.